Habitat: Liquorice plant is native to southern Europe and south-west Asia. It prefers fertile, well-drained soils, with lots of sun. 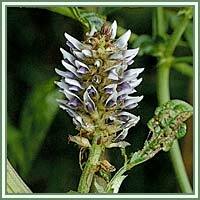 Description: Liquorice is herbaceous, perennial shrub, growing up to 1 meter in height. Leaves are pinnate, long with 9 to 17 leaflets. They are heart-shaped, silver to yellow in color, covered with soft hairs. Flowers are produced in a loose inflorescencefrom the axils of the leaves, purple to pale whitish blue in color. The fruit is an oblong, smooth pod, 2 to 3 centimeters long, hiding several small seeds. Useful components: Anethole, glycyrrhizin, glycyrrhizic acid, saponins, coumarins, sterols, choline, triterpenoids, lignins, amino acids, folic acid, lecithin, pantothenic acid, phosphorous, pentacyclic terpenes, protein, sugar, vitamins B1, B2, B3, B6 and E.
Medicinal use: Liquorice root is an excellent demulcent and a mild relaxant, and is very helpful in cases of coughs, colds and bronchial irritations. It can be very useful as an addition to antibiotic treatments, accelerating the healing of stomach lining. Liquorice can also be used in treatment of ulcers appearing in mouth and the digestive tract ( it is very effective against Helicobacter Pylori), but also in treatment of great variety of ailments, such as certain viral infections, menstrual disorders, allergic disorders, asthma, depression caused by hormonal imbalance, emphysema, hypoglycemia, eczema, herpes etc. 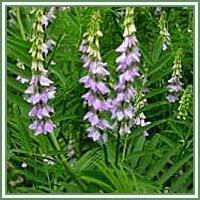 Glycyrrhizin glycosides, structurally similar to the natural steroids of our body, are responsible for the beneficial action this herb has in the treatment of adrenal gland problems such as Addison's disease. It increases the secretion of bilirubin in the bile and lowers blood cholesterol levels. It neutralise many toxins such as those of diphtheria and tetanus, and can be helpful in treatment of tuberculosis. Its strong anti-inflammatory actions make Liquorice root an indispensable herbal remedy against autoimmune diseases in general. It can even be used as an eyebath in conjunctivitis and other inflammatory conditions of the eye surface.